Here you can see the Playstation 4200, which is a quite recent work (Jannuary 2014) that was created for the Opening Festival 2014 in Trier. As most of my works in sound art, Playstation 4200 starts with the interest in a specific philosophical concept and the question of its aesthetic understanding, reflection and application. It revolves around the concept of „games“ which the Austrian philosopher Ludwig Wittgenstein developed in his later work (his writings „philosophical investigations“ and „on certainty“ were my main sources). This concept of „games“ is a very demanding one, as it proposes a wide understanding of games, which leaves the player with a lot of metaphysical assumptions that have to be embodied in order to be able to play. This concept of games can derived from Wittgensteins language-game theory which intended to speak about the use of language functioning similar to games rather than games in general. But the language-game theory can as well be used to think about forms of behaviour that are often referred to as games (for example billard). Without going to deep into the explanation of the language game-theory, we can state that a game is: 1. A contingent social practise, 2. That encompasses a lot of different rules, 3. Which define the meaning of the single objects of the game (a queen in chess has the meaning of its possible moves), 4. That is learned in a playful mannor, 5. By the training in a group, 6. That uses the elements (for example words) as tools for action, 7. That is contextreferential (games do have spaces that they are played in, where they are thus experienced to be appropriate) 8. Furthermore it encompasses a world picture (a group of assumptions about the world that have to be believed in order to be able to play the game) 9. Games are unfounded (they are based on believe and training (Abrichtung)). But what is said about language-games can also be said about games in the common sense of the word. Playstation 4200 is an applied investigation into the relationship of games, believes and worldpictures. It deals with Wittgensteins thesis that every game, in order to be played, needs an operating worldpicture, which is setting the axioms of the game. The worldpicture of a game does not only contain the onological settings of the game (for example that in football there is players and a ball but no peacocks, that the ball has to move through a metal frame etc) but also the anthropological configurations that are enacted and practised in it. Moreover the human beeing that is playing a certain game is becoming part of a community and getting socialised in it by playing a game. Every musical instrument thus also appears to us in the frame of different „games“ that we are used to play with it. A guitar does not appear as a thing that is used to play golf, but as a thing that is used to play Death Metal, for example. Furthermore we can say that every musical instrument has a myriad of musichistorical contexts that it appears in, a myriad of different world picture which it is placed in. 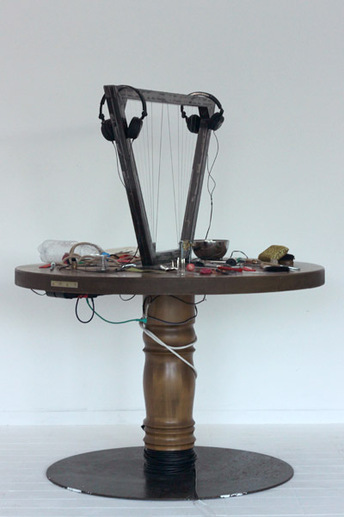 Playstation 4200 is constructed out of a round table, 2 headphones, amplifier, soundobjects, 12 guitarstrings, 2 guitarpickups and metalframe. Beeing constructed like this, it has a certain structural analogy to an electric guitar and playing on it has a certain analogy to playing prepared guitar (with all the historical connotations of this instrument and the tradition that is referenced as soon as it is practiced). But this makes the fundamental assumption of the work come through: Allthough it is structurally analogue to an electric guitar, the relation to it is a very different one. It confronts the audience with a game that does not have a worldpicture. The audience is thrown back on itself, finding itself in a situation that asks for making up a worldpicture through the intuitive use of the object. 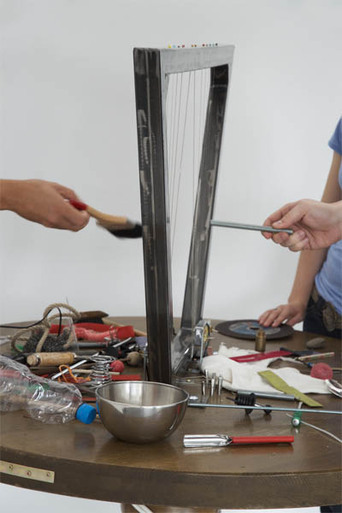 This process of conceptualizing, playing, experimenting, is an essentially communicative act. The visitors are playing with the object and make up the rules of the game as they play, they find their rules individually as well as communicatively. The openness of the situation asks for invention, as their is no set mode of conduct, no game. As human beeings think from different angles, it is possible to watch and listen to people communicatively making up their own, individual worldpictures while they are making sound on the Playstation 4200. Playing becomes more than itself: Now it is a epistemological, (music)ontological act, that asks for a specific responsibility and openness for the (unforseen) action of the other and the developement of the situation, which opens the view to the wide assumptions we make as we are creating sound.